Kielgast J, Lotters S. 2009. Forest weaverbird nests utilized by foam-nest frogs (Rhacophoridae: Chiromantis) in Central Africa. Salamandra 45(3):170-171. Abstract. We report that the Afrotropical anuran Chiromantis rufescens may use empty forest weaver bird nests above water for deposition of foam-nests with eggs. Our observation was made in January 2008 at a temporary pond in primary rainforest of Salonga National Park, Democratic Republic of Congo. To the best of our knowledge this is the first ever report of utilization of bird nests by amphibians. We expect that bird nests with their tube-like entrance were difficult to access for frogs and that the choice of this oviposition site was non-random. If so, it may be a response to strong egg predation, e.g. through primates, as known in C. rufescens. 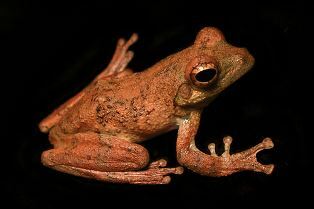 The authors found two cases where African foam-nest tree frogs used the deserted nests of the Blue-billed Malimbe to build their foam-nest. This frog usually builds its nest on branches overhanging water. Read more about the Blue-billed Malimbe.